1. Turn on your Cupcake & Muffin Maker and allow to warm up while you prepare the mix. 2. Put the chocolate into a heatproof bowl and set over a pan of gently simmering water. Do not let the bowl touch the water. Leave until melted and set aside to cool slightly. 3. Beat the butter and sugar together in a bowl until pale and fluffy, then beat in the eggs, one at a time. Beat in the melted chocolate, then stir in the almonds. Sift the flour and cocoa powder into the mixture and fold in, followed by the kirsch and glace cherries. 4. Open the machine and spray with a little spray oil. Place a spoonful of the mixture into each cupcake cavity then close the lid and allow to back for at least 8 minutes. You can check if the cupcakes are done by inserting a skewer into it and making sure it comes out clean. 5. To decorate, put the chocolate in a heatproof bowl. Heat the cream in a saucepan until almost boiling, then pour over the chocolate and leave to melt for about 5 minutes. Stir until smooth and creamy, then stir in the kirsch and leave to cool for about an hour until thick and glossy. 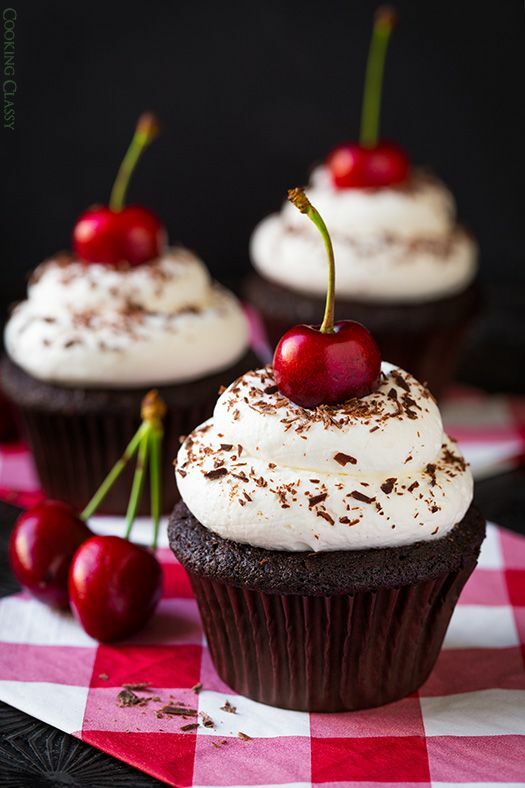 Spread the frosting over the cakes and top with a glace cherry. Serve immediately.